Everything about this books is intriguing: the cover, the title, the blurb. And it is! Hodkin's writing kept me on the edge of my seat the entire time I was reading it. However there were parts that I feel didn't really mesh with the entire plot. Or some parts that did but weren't quite fleshed out. I was honestly expecting to give this at least four stars but I couldn't. There are redeeming factors though so I'll give it that. The mystery. From the very first page, I was drawn in by the mystery of Mara Dyer's past. She had no recollection of the accident that took her friends' lives. Bit by bit she gets her memories back and it wasn't a pleasant experience. I particularly liked how these were written. It was in different chapters instead of lumped towards the end like some books that aims to give readers one heck of a surprise but ultimately fails because there wasn't enough build up. I think Hodkin did a great job at beefing up the mystery in parts and then letting it all come together in the end. It really kept me flipping the pages, eager to know more. The writing/voice. While I think Mara was a bit of a doormat whenever Noah's involved, I still think she's a fairly likable protagonist. There wasn't a dull moment for me because Hodkin's writing was simply captivating. And it helped that she told the story through a character like Mara. There's just something about her voice that makes it easy for me to read through every chapter. The end. This may be the one thing that kept me from rating this book lower. I really liked the WTF part at the end. I can't say it was predictable, really, because I am admittedly slow when it comes to guessing plots. I will say this though: it made me want to start the next book immediately. As in I was silently cursing myself for not getting the second book when I bought this one because it was pure torture not having answers to that ending. But I will restrain myself from ordering a copy because the third books won't be out til November. The paranormal. I know this is basically what the book is about but I feel like it could've been presented better. The build up was great but once answers (or sort of answers) were finally given, I feel like I still had this huge question mark above my head. The paranormal aspect was kiiiiind of weird to be honest. It's like I wish it stayed a mystery because that made more sense even if it really didn't. Too much romance. Don't get me wrong. I totally love Mara and Noah's banters. I just wish there was less romance (if you can call it that) in the story. At some point I forgot all about Mara's crazy dreams and "powers" and whatnot because there was just so much focus on Mara digging on Noah. (Or Noah being so obsessed with Mara... but he had his reasons.) And it also bothered me that Mara was oblivious to Noah's frequent (because sometimes he's not) douchebaggery (it's a word) JUST BECAUSE HE'S SMOKING HOT. So that's that. 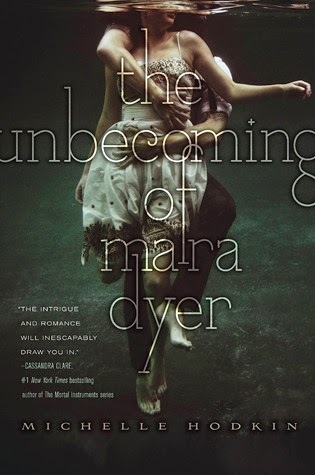 I'm still eagerly looking forward to The Retribution of Mara Dyer because that would mean I can finally lift my ban on buying The Evolution of Mara Dyer. I will definitely marathon the next two books. I need answers, Hodkin, and they better be freaking good. Great review! I totally want to buy this book but I'm stopping myself because I know I won't be able to read this soon. Anyway, the mystery (what's intriguing) and the voice or writing style are what I always look for when reading books! And I love paranormal and romance books but sometimes, there's just too much of these two that sours up my mood for reading. I've wanted to read this for a long time but people keep telling me that Noah's annoying... Although, I do love mystery so I guess I can endure a little romance, right? Thanks for this review! !